I love being a blogger as opposed to an academic because I can write things like “Holy crap this book is scary”. When I was an English Lit student, I was supposed to write things like, “Maplecroft uses the matrix of sisterhood to deconstruct the Lovecraftian mythos. The Monsters are both Freudian and Jungian symbols, revealing the inner psychology of the siblings and the historical framework in which they navigate illness, gender fluidity, sexuality, and sublimated aggression”. Here’s what you should actually know about Maplecroft: it’s a fantastic book and holy crap it’s scary. Do you guys remember in “Friends” when Joey liked reading The Shining but he had to keep it in the freezer when not reading it because it was so scary? 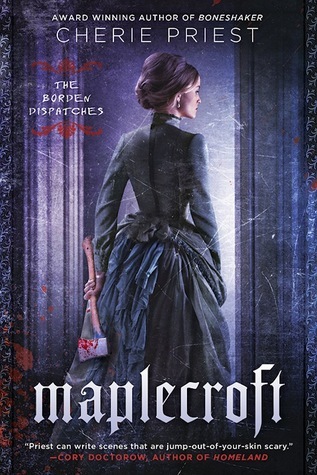 Maplecroft opens two years after the famous Borden murders (as in “Lizzie Bornden took an axe and…”. In real life, Lizzie was never convicted. In the book, Lizzie did kill her father and stepmother, but only because they had turned into murderous, unearthly monsters. Lovecraft fans will be pleased to know that there’s a lot of gibbering in this book. Lizzie and her sister Emma, who is dying of consumption, live in a house called Maplecroft. Lizzie built a laboratory and a “cooker” in the cellar and she spends her nights killing monsters with her axe (they hate iron) and her days tending to her sister and trying to figure out what happened to her family and why these gibbering slimy monsters with long glassy teeth (they look like anglerfish teeth, which Eeeeeeuuuuuugggghhh) keep surrounding her house. The sisters live in near total isolation ever since Lizzie sent her lover, a woman named Nance, away for her own protection. I will come to you and we will meet and you must explain to me as much as you can as much as anyone can what has become of the ocean not the ocean but which lies in the ocean, from whence cometh the sample I have named Physalia zollicoffris I have named it after myself because it came before myself and now it is myself, we are the same now you see or you will see I will see to it I will see to you. So, yeah, that’ll end well. I’m sure you could read this book with great satisfaction even if you know nothing about the Lizzie Borden murders but I found that knowing some of the background made the story richer. A lot of historical details are woven into this book and made to serve the story – most notably, the fact that the Borden family complained of feeling sick, maybe poisoned, for some time before the murders. Like any good speculative fiction, the outlandish parts of the story work because they are anchored in mundane things. For instance, Lizzie talks about having problems with her stays creaking, Nance has freedom to explore sexuality because she’s an actress, Emma struggles with consumption, and the women have a realistic if torturous dynamic. Because of the way the supernatural elements work, you can’t always tell whether people are feeling resentment and hostility towards each other because they are succumbing to possession, or because they are trapped in an untenable situation. Emma and Lizzie in particular resent and depend on each other. Monsters aren’t that scary because they are pretend, but sibling conflicts, being trapped by illness as either a sufferer or a caretaker, being kept from pursuing careers and lovers because of gender, and social isolation – those things are scary because they happen all the time. They were very real parts of Lizzie’s life. There’s so much tension in the book that it’s almost a relief when she actually gets to hit something. This is the first book in a series. It doesn’t end on a cliffhanger but it’s clear that a sequel is on the way and I’m DYING HERE. It looks like the sequel will come out in September 2015. In the meantime, I hope Lizzie gets to take a nap, because that woman is exhausted. This entry was posted in Book Reviews and tagged Cherie Priest, historical horror, Lizzie Borden, Lovecraft, Maplecroft. I loved the hell out of this book. 🙂 Cherie Priest has been one of my auto-buy authors for some time now, but this one was one of the most entertaining I’ve seen her do since Boneshaker! I have to be in just the right mood to read a scary book. I used to like reading one on a cold winter evening, preferably during a memorable snow storm. That’s hard to come by in North Carolina, but the forecast is for a hard winter this year. 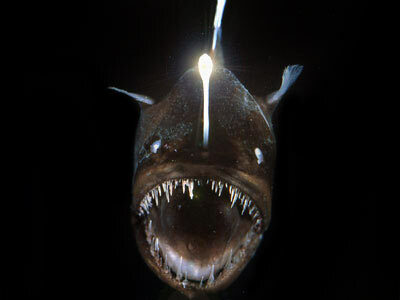 I think I need to get a good scary book on hand so that I’ll be ready if the opportunity presents itself.